We use Basecamp to manage all our ministry’s major projects, plan events, and manage some key processes. It’s an intuitive, simple online platform for a team to collaborate on projects, assign and track to-do’s, share and discuss files, and monitor progress. You can create templates for recurring events, projects, and processes and launch them when you’re ready to start planning or working. You can add any number of people to each specific project. You can set various levels of notifications by email. There’s an accompanying mobile app with push notifications. AND, using Zapier, you can integrate it with other web services like Google Calendars, Evernote, Google Docs, Dropbox, Gmail, etc.! We use Basecamp in three primary ways. 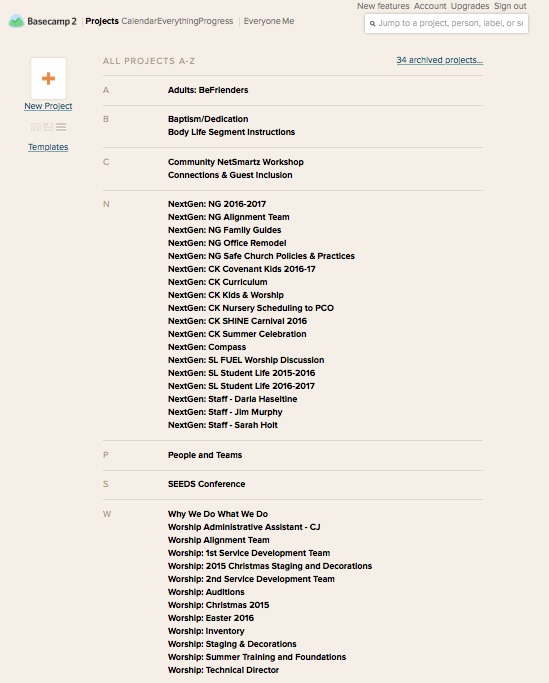 We create a project for each ministry department (for those who want to use it anyway). These are then organized alphabetically by area of alignment. Each area of ministry has various categories of to-do’s and discussions tailored to their needs. I like to create a separate to-do list for each event or initiative. Each to-do list is organized sequentially according to the calendar. Some to-do’s have a due-date. Some are assigned to people on the team. Some have embedded web links to the internal google form that must be completed for our office and facilities staff. Some have documents attached to them like recurring letters, brochures, and registration forms. Others are simply noting to launch another project by a certain date. These are for those events and projects that have multiple categories of to-do’s and require an entirely separate team of people. Some of our projects are just that…projects. That includes curriculum planning, environment remodeling, marketing or informational projects, etc. These are usually document-sharing heavy, with version tracking, and lots of discussions. Some of our projects are special events with many of them recurring annually. Basecamp is great for creating templates that can hold to-do lists, supply lists, timelines, documents, forms, web links, role assignments, and so on. These templates can be launched any time you’re ready to start planning it. With a little extra work, you can also pre-program the template with to-do’s that automatically calculate their due dates by how many week’s out from the project’s launch date. You could even create a Zap (with Zapier) that lets an event on your Google Calendar trigger a set of to-dos in Basecamp. We haven’t tackled these last two options yet, but you can see the potential here! The third primary way we use Basecamp is for templates of key processes like hiring new staff and all its guiding protocol, new staff orientations (to which we add the new staff and their supervisor) with all the important employment documents, areas of training, tutorial links, people to meet with, etc. Soon, we might begin using Basecamp for recurring processes like tracking guests and baptism/dedication candidates using Zapier to connect our Text-in-Church automated campaigns with Basecamp. Basecamp has been a great tool for managing our projects, events, and processes effectively and efficiently. You should check it out. I’d like to know you if you have used Trello and maybe why you pick camp base over Trello? Hi Brett. I really like how visual Trello is and I know others claim it’s great as a collaborative brainstorming tool but I don’t know how well it works as a project or task management tool. Maybe, Trello “boards” could work the same as Basecamp “projects.” Trello “lists” could work the same as Basecamp “to do lists.” Trello “cards” would have to serve as Basecamp’s to-do items (meaning each card would be a separate task) since that’s the only place you can assign a team member, assign a due date, or attach a file. Individual items on Trello’s “checklists” can’t be delegated to team members, given due dates, nor have files attached. However, the Trello checklists can “mention” team members’ names as a work around. They could also serve as sub-todos (nested lists, or to-dos under to-dos), which is a feature missing in Basecamp. 1) the ability to see all the files attached to cards in a “board” all in one place. Nor is there a way to discuss a file without making it it’s own card. 2) the ability to see due dates in a single calendar across all boards. 4) and, most significantly, create and store templates for recurring projects, events, and processes. Anyway, these are my impressions. But I’m not as familiar with Trello as others might be. Thanks Jim! This is very helpful as I compare both programs. I think another element missing from Trello that Basecamp has is the auto-questions. This is very helpful for me in accountability, information, and collaborating with church staff and volunteers. Thanks again! Are the auto-questions in Basecamp 3? Tell me more about them? Yes, they have auto-questions in basecamp 3. I am still new to it, but you can ask specific questions on teams or projects. They upgraded it yesterday, so you can now specify when you want those questions to be asked (weekly, monthly, day, and time). I enjoy it because it allows me to hold my staff and volunteers accountable without the feeling of micro-managing over them. That’s great. Another reason to upgrade! Jim, do you find there is a challenge for church leaders and members to adopt this new system? Many times people don’t want to create another account, or download another app, and remember another password for some program. Then the problem is not everyone on your team is effectively using the platform you need them to for everyone to stay on the same page. How does basecamp mitigate that challenge? Can you communicate needs and to do lists to people in your team who simply won’t log in to the basecamp platform? Hi David. Yeah, that’s a struggle for sure. I find the biggest hurdle is getting over the difference between paper people and digital people. Some only use paper to keep track of things. Others embrace digital methods more easily. Another hurdle is the difference between people who can think non-sequentially and are able to understand the multiple layers and dimensions of a digital platform and those who can only think sequentially and require notes and instructions for every single step on a digital platform. I’ve explored the possibility of printing the to-do lists, and scanning up handwritten documents, etc. but that defeats the value of system’s efficiency. So I gave up on trying to blend them and am finding that the more I lead our team into it’s benefits (long term institutional memory, recurring task lists that don’t require us to reinvent the wheel every time, common file storage and collaboration, etc) and “require” their use of it, the more they embrace it’s value. But, using a fishing metaphor, I haven’t pulled the line so fast and tight that it breaks, though. I’ve given them time, freedom, and space to grow into it. They sometimes complain or forget but the more I remind them, and ask them to use, the more it becomes part of their routines. How are you handling that struggle? I’m so sorry but I don’t think I replied to the comment you made on my blog post back in September. I’m terribly sorry for missing it! Yes! I have found it to be a challenge to get everyone on the same system. At first I didn’t want to push very hard because I recognized that some people are just “paper people” and others get easily overwhelmed with managing too many online platforms. So, we tried working in a hybrid system where some are online using Basecamp while others get print outs of the checklists or are brought up to speed in face-to-face meetings. But as time went on, and those who adopted Basecamp early were becoming more productive and efficient while they were missing out on discussions, missing assignments, and forgetting details, they started to realize how valuable and important it is to embrace it themselves. Unfortunately, though, this approach creates a lot of frustration and tension over a long period of time. If I could give any advice here, it would be to simply REQUIRE those who work under you to all adopt the same system regardless of their personal preferences. People working in hospitals, government agencies, airports, restaurants, retail, and any large business, etc. all have to get over their preferences and learn the company’s system. It shouldn’t be any different here. If it’s your peers that are the challenging ones, then you must convince your lead/senior/executive pastor or whomever it is that everyone reports to adopt the system and require its use by everyone. Or, just slowly work out the tension over time, like we have.